I had a very specific card in mind for a post for this past Father’s Day, but I’m still in unpacking mode after the move, which made it all too easy for me to not scan the relevant card for what I intended to write. Continuing on a theme I started last week, I have made note of the post and will most likely use it when my dad’s birthday comes up in October. Until then, a related post: my 1989 Swell Bo Belinsky PSA/DNA Certified Autograph card. In addition to collecting cards , I like to collect autographs as well. Since many Phillies of the past will almost certainly never appear in a Phillies uniform on a certified autograph issue (and I don’t trust Topps to catch up with the players who should receive one before they pass away — à la, Johnny Callison), I have purchased quite a number of third-party authenticated autographs. Due to storage issues, I prefer slabbed cards, such as this Belinksy card, and photos over signed balls, but I’m not that picky on the matter. The fact is I have plenty of all three. For reasons I’ll illuminate more fully when I get around to writing the post I meant for Father’s Day, Belinsky was one of the first PSA/DNA certified autographs I acquired. 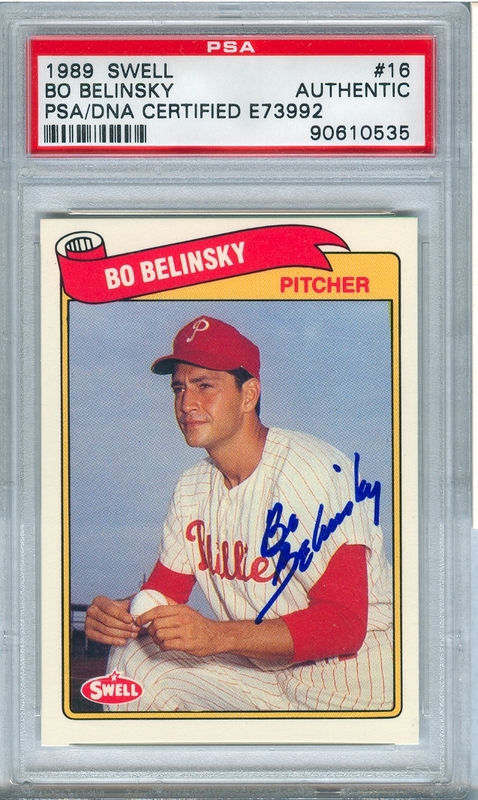 It was in honor of my dad and all the help he gave when I collecting cards as a kid, and while I could have just purchased his 1999 Fleer/SI Greats of the Game certified autograph for less money than I spent on this Swell card, I felt it was necessary that I have Belinsky’s autograph on an item depicting him in a Phillies uniform. So even though I called you on Father’s Day, dad, here’s a belated, additional Happy Father’s Day.